Your paycheck doesn’t come for another week, but rent is due tomorrow. You’ve spent last weeks paycheck already, and have no one willing or able to loan you the money. Sure you could go to a payday advance place and get some money, but the interest is too much. As you walk along the street you see a food eating contest, with a prize of $1000. Without hesitation you go over, figuring that at the very least you’ll get a meal out of this. Not only do you get the meal, you win the $1000 and are able to pay your rent. In a way that is exactly how Matt Stonie (Megatoad) got his start as a competitive eater. Matt Stonie’s net worth is $500,000 though at the rate he is going it should be over a million soon. He rose to fame in 2015 by winning Nathan’s hot dog eating contest. Defeating 8-time champion Joey Chestnut. Matt Stonie holds 20 world records related to eating such as eating an entire 5.5-pound birthday cake in under 1o minutes, and 113 pancakes also in under 10 minutes. With his rise to fame also comes his rise in YouTube followers. Before he won the Nathans hot dog eating contest he had less than 1 million subscribers. However only 2 years later he has over 3 million with that number growing every day. He uses this channel to not only grow his brand but also to grow his income through ads on YouTube. They say that necessity is the mother of invention, if that’s true then I would say desperation can be the mother of your next career. 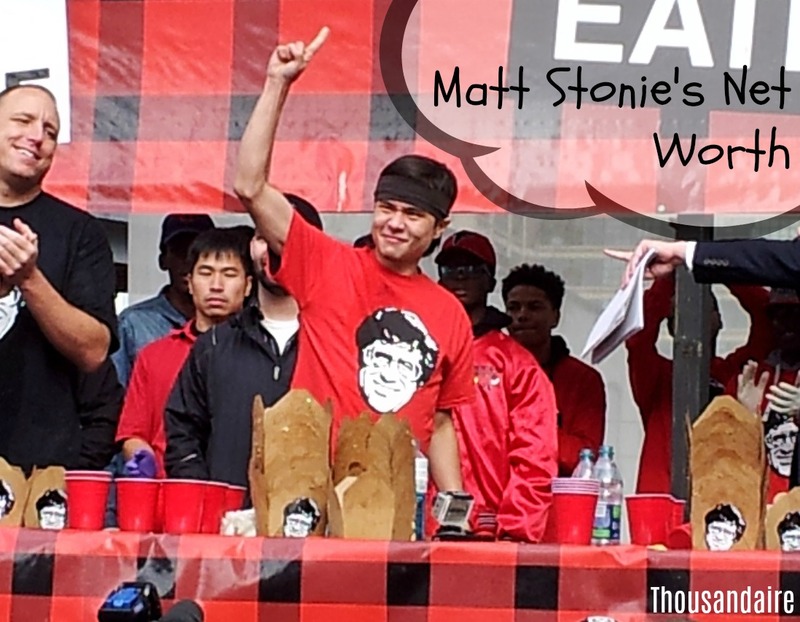 Matt Stonie needed some extra money and decided to participate in an eating contest. Through that, he discovered he was good at it, and now it’s his full-time job. Some of us have no clue what we’re actually good at or enjoy doing. Or maybe we know what we enjoy but don’t know how to make money from it. Either way, when our backs are against the wall we can often times find a way to make money come from somewhere. Also, there is nothing wrong with taking advantage of your 15 minutes of fame. Matt Stonie grew his YouTube following, but only after winning a competition and getting a little bit of fame. Through that, he didn’t just ignore those that subscribed but made sure to continue to post content for them to watch and learn more about him. If something happens to us, whether that’s getting actual fame, or maybe just a face to face with an influencer, it’s ok to use that to grow your own brand. The hard part won’t be gaining traction, the hard part will be keeping it going after you get that initial boost. Sure the influencer gave you a push but it’s now your job not to drop the ball and make sure that you grow on your own from then on. I love these posts! The net worth of the various YouTubers are so crazy to me. I love how this guy got into competitive eating too!